Start with a base of time travel, add a dash of adventure and romance with a pinch of historical fiction and you end up with Outlander, a thrilling new series from Starz. Based on the wildly popular series of the same name from Diana Gabaldon, the series follows protagonist Claire as she is torn not only between two men, but also two times. 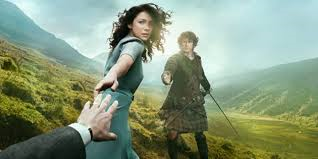 The series has been something of a smash hit for Starz, breaking records for the network. Now that the mid-season premiere is set to come on April 4th, it’s the perfect time for a refresher on what happened during the first half of the season. If you’re not caught up yet, this will contain spoilers, so hurry out and catch up on back episodes with services like Vudu, Starz Play or DirecTV and then come back and finish up the article ahead of the premiere. The series begins with Claire Randall (played by newcomer Caitriona Balfe) and her husband, Frank, who are on a much needed vacation in 1945. The two have been reacquainting themselves after five years of separation during WWII. While on their vacation in Scotland, Frank goes digging into his family's past and comes across an especially interesting character named Jonathan "Black Jack" Randall in his family history. At the same time, Claire explores an ancient site of standing stones when she begins to hear a strange buzzing coming from one of them. As she places her hand upon it, she losses consciousness, only to awaken in the Scottish Highlands, 1743. She is now caught in the peak of the Jacobite risings, a political and civil war for Scotland's future. Almost as soon as she arrives in the past, Claire encounters Frank’s ancestor, Black Jack, who bears a very striking physical resemblance to her husband. Despite the outward resemblance, Black Jack is as evil as they come, and Claire must protect herself from him and his aggression towards her. She’s soon rescued from Black Jack by a man named Jamie Fraser, and he takes her back to his home. Having been a nurse in the notoriously bloody WWII, Claire’s skills help her gain the trust of the MacKenzie clan, with whom Jamie lives. The clan leader, Colum MacKenzie, forces her to stay and become the clans healer instead of heading back to the standing stones so she can return to Frank. Her hope is that, by working as a healer for the clan, she’ll gain their trust and eventually her freedom. However, that backfires as she essentially makes herself indispensable to the clan thanks to her modern medical knowledge. During this time, she gets to know Jamie better and even starts to developing feelings for him, which only leaves her more conflicted about her situation. Soon Claire finds herself back at Inverness, the site she was transported to previously via those stones. While there, she hopes to find the stones and transport herself back to her husband, but another encounter with Black Jack halts her plan as she finds herself in a difficult predicament. In order to protect herself from Black Jack’s advances, Claire marries Jamie and the duo has a hard time restraining their feelings. Meanwhile, her (other) husband, Frank, is quickly losing his hope of ever finding Claire until one fateful moment when their voices connect, albeit hundreds of years apart. The two, who are standing near the stones at the same instant, hear each other’s voices, at which point Claire is faced with the realization that she’ll have to make a choice between her two lives soon. Leaving viewers with an incredible (and frustrating!) cliffhanger, the second half of the series is expected to live up to expectations and be full of intense drama and action. While we can’t predict that Claire and Frank will be reunited, especially since season two has already been ordered, we do expect the inner turmoil Claire has been experiencing to rear up its ugly head if she isn’t careful. Plus, based on some new promotional images, inner conflict isn’t going to be the only thing rearing its head in the second half of the season.